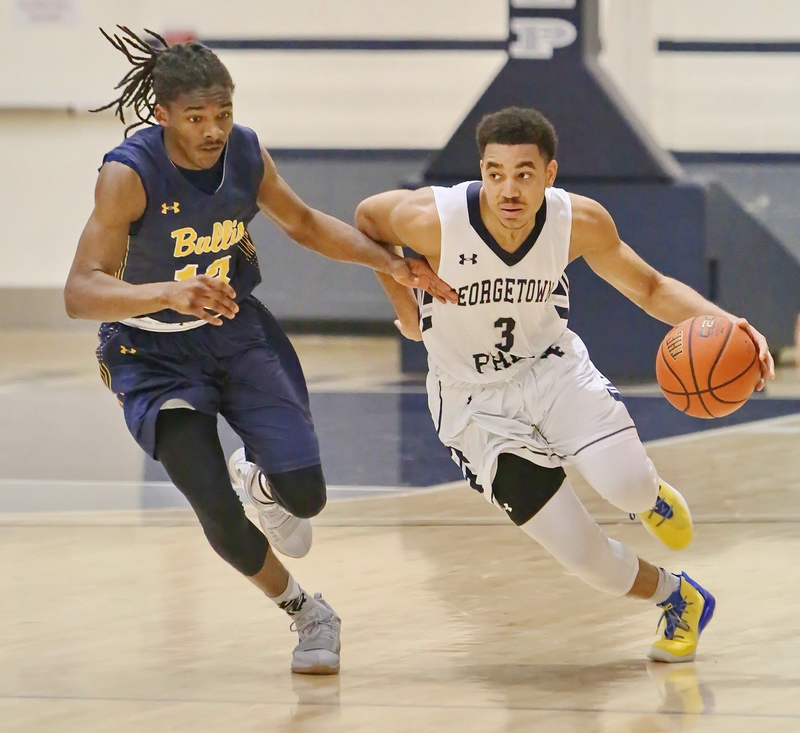 George P. Smith/The Montgomery Sentinel Georgetown Preparatory School's Milton Bynum (#3) takes the ball upcourt as a Bullis player gives chase in the game played Thursday, January 11, 2018 at Prep. “Get to Know Jared Bynum” is the third part of a multi-article interview series with incoming players in the A10. The series will give fans a chance to get to know their newest stars before they take the court. Big shout-out to super fan Ryan Feely for suggesting to do this interview with Jared, and for his thoughts on the questions. Last year, St. Joseph’s finished fourth in the conference, and came within two minutes of reaching the A-10 Championship Game. This year, the Hawks will try and return to the dance, with the help of players returning from injury, Lamar Kimble and Charlie Brown, and newcomer, Jared Bynum. I got the chance to catch up with Jared, and to see what his thoughts were on the recruiting process, his game, his future at St. Joseph’s, and more. JR: Being from the Baltimore area, what made SJU stand out over the other schools you were considering? JB: St Joe’s recruited me for more than just being a basketball player. They got to know my family and my circle that is close to me as much as they got to know me. They have given me that family feel that I know is real. Ever since they started recruiting me they made it clear to me I was a top priority. I am comfortable that Coach Martelli and staff will make me a better basketball player, and a better person. I also see myself as a student at St Joe’s, even if I am not a student athlete. JR: You’ve been a winning player your whole career, and seem to play with something to prove. What motivates you to play like that? JB Winning is the most important thing about basketball. Everything you do from preparation to everything you do on the court is to win games. I’ve always played with something to prove. Being a smaller guard I have to play that way. Smaller guards are often over looked and playing with that extra competitive edge and chip on your shoulder helps you show everyone what kind of player you are. JR: With Lamar Kimble coming back from injury, do you consider yourself strictly a point guard, or do you anticipate playing off the ball at times while you are both on the court? JB: I mostly play point guard but I am also good playing off the ball as well. A point guard doesn’t always need to have the ball in order to be a point guard. I feel like the way me and Fresh both play, and play off of each other, will benefit both of us and will be hard to stop. JR: What did you like about the coaching staff? How long had they been recruiting you? JB: I really enjoy the coaching staff and am excited to play for them this year. After attending games and practices I know for sure they will make me a better player. All of them know the game, have played the game, and are people I can learn a lot from. Everybody that knows college basketball that I have talked to has told me how much I am going to benefit from playing for Coach Martelli, and I’m excited for that. They first saw me play freshman year but did not reach out until the first time they could call players which i think is June 15 or 16. JR: What do you expect your role to be in your freshman year? JB: Coming in as a freshman I’m looking to have an impact from day one. I’m ready to come in and contribute as much as I can both offensively and defensively. Coach Martelli has expressed to me that he is not going to hold my game back and he is going to let me play which I am ready to do the day I get on campus. JR: Like yourself, Jameer Nelson came to hawkhill as an “undersized” point guard. Have you watched any highlights of Jameer when he was on SJU? And if so, was there anything in his game that you hope to implement in yours? JB: I haven’t been able to see footage of Jameer Nelson at St Joe’s, but I did watch him a lot when he was in the NBA especially with the Orlando Magic. His outside shooting and how he was always able to get two feet in the paint whenever he wanted has always stood out to me. JR: What’s your biggest strength as a player? JB: I would say my biggest strength is my ability to shoot the 3 and to get in the lane and makes plays for myself or my teammates. JR: What are your goals at SJU? JB: My goals at St Joe’s are to win the A-10 championship and to make a run in the NCAA Tournament. What’s something people don’t normally know about you? What’s one thing you would like Hawks fans to know about you?